Install Linux on an arbitrarily large number for computers with a push of a button. 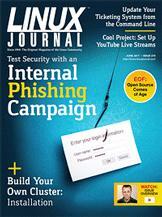 Are your users the weakest link in your anti-phishing strategies? Try Gophish and find out. Shawn Powers' The Open-Source Classroom Live Stream Your Pets with Linux and YouTube!